After the seeing the spectacular new trailer for Aquaman, the only thing we’re not 100% onboard with is how long we still have to wait to see Jason Momoa’s take on the legendary hero. …On the big screen, that is. 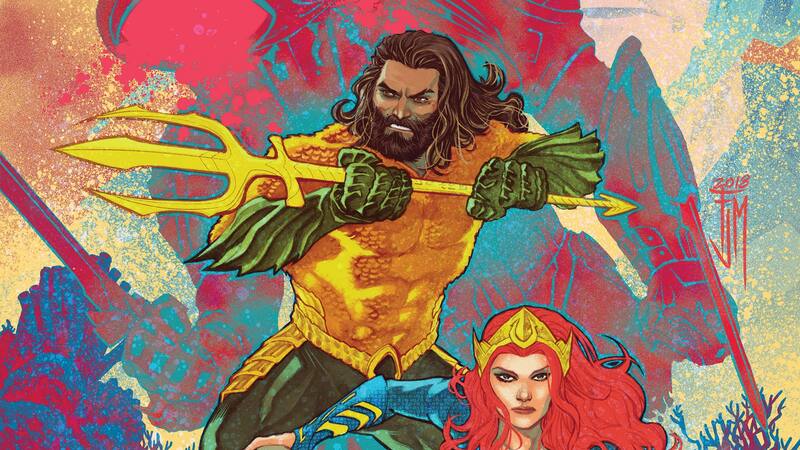 While James Wan’s eagerly awaited movie doesn’t hit theaters until December 21st, you can catch Momoa’s Aquaman along with Amber Heard’s Mera in an exclusive series of movie-inspired variant covers that will grace this fall’s Aquaman/Justice League crossover event, “Drowned Earth.” And even better, the event kicks off later this month, meaning you only have to wait a few weeks to grab the first cover. Last week, we revealed the movie variant covers for Parts One and Two of “Drowned Earth,” drawn by Francis Manapul and Francesco Mattina, respectively. Now, you can take a gander at the four remaining covers by Ben Oliver, Lucio Parillo, Dale Keown and Nicola Scott. They’re all in the gallery below, along with which comic you’ll find them on. "Drowned Earth" officially kicks off on October 17 with JUSTICE LEAGUE #10 and AQUAMAN #41 (both prologue issues) before kicking off officially on October 31 with JUSTICE LEAGUE/AQUAMAN: DROWNED EARTH #1. James Wan's Aquaman, starring Jason Momoa and Amber Heard, is in theaters December 21.